BOZEMAN, MT. 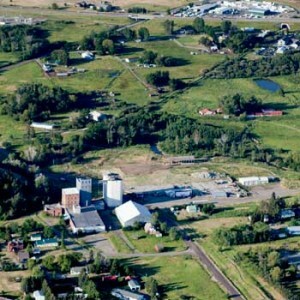 – The Trust for Public Land announced today they have secured an option from American Bank to purchase a 61-acre property near the old Story Mill in the northeast section of Bozeman and hopes to eventually sell it to the City for the creation of a new park. Five years ago, the land was planned for a large development of 1,200 residences along with commercial development, but those plans collapsed into bankruptcy in the economic recession and American Bank foreclosed on the property. The purchase by the Trust for Public Land offers the opportunity to transform the Story Mill property into a showcase park to the benefit of the community. The property is just west of the old Story Mill, which was founded in 1885 by Nelson Story and once the city’s largest employer. Two railroad lines ran near it and the land also contained a cattle stockyard and slaughterhouse. The property includes the Story Mill Spur Trail, which connects downtown Bozeman to north-side destinations like the East Gallatin Recreation Area, and will someday link to the “M” and Drinking Horse Mountain trails. Earlier this year, Bozeman voters overwhelmingly approved a $15 million Parks and Trails Bond to be used for acquiring land for parks, trails, waterways, and recreation. The city of Bozeman is setting up a process to review applications for acquisitions through the bond, and the Story Mill project could be one of the earlier projects considered for a portion of these funds. The public funds would be matched by private donations for park development and improvements. The Trust for Public Land is also exploring the potential for private redevelopment on the site of the former Bridger View Trailer Park, including affordable residential housing. Residents can take part in a public opinion poll at www.surveymonkey.com/s/StoryMill.